Sat Nav: HA7 4LP will bring you to the RNOH Hospital Entrance – see Point 2 below. Take the 107 bus from Edgware Bus Station, located outside the tube station, to the RNOH Gates on Brockley Hill. 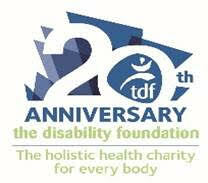 Allow at least 10 minutes to walk from the bus stop to The Disability Foundation. The RNOH is a 30 minute uphill walk or a ten minute taxi ride – taxis are available outside the tube station. Alternatively take the free RNOH Courtesy Car from outside Stanmore tube station, Bus Stop A. This service runs Monday to Friday only. No service on Saturday or Sunday. Vehicles pick up and drop off at Orthotics, Outpatients Department and the Main Gate only. The nearest stop to TDF is Orthotics. Then cross the road & enter via the Prosthetics Entrance. This service can only accommodate collapsible wheelchairs. At the roundabout where the A41 intersects with the A410, take the first exit left onto the A410 (Spur Road) & follow the road until you get to a mini roundabout – this is Canons Corner with a petrol station and McDonalds on the left. At that mini roundabout, turn right (third exit) & go up Brockley Hill. At the top of Brockley Hill, after Wood Lane on the left, take the next left into the Royal National Orthopaedic Hospital Main Entrance. Proceed along the road straight through the hospital site. There are occasional signs for The Disability Foundation. Go past the main car parks, which will be on your left & your right. ** Carry on up a slight incline and pass the Orthotics Department which will be on your right – the building has a clock tower. If you are a pedestrian or require completely level access & automatic entrance doors, it will be best to enter via the Prosthetics Department on the left, just before the road bends left. There are a number of disabled parking spaces. Enter via the automatic doors, turn left & left again into the long corridor – TDF Reception is on the right. If a small step & non-automatic doors are acceptable, follow the road round to the left. The Disability Foundation is in the Louis FleischmannBuilding immediately on the left. Park on the “cinder” car park area. Enter through the double doors. TDF Reception is straight down the corridor, on the right. Keep left & go down the road to the T junction. This entrance is only available Monday to Friday, 7am to 7pm. From Stanmore Hill, turn left (if coming from Bushey) or right (if coming from Stanmore) into Warren Lane. Proceed for a few hundred yards until there are two turnings close together on the left. Take the second left, follow the lane round until you pass through the RNOH West Gate & follow the road to left. The Louis Fleischmann Building will be on the right. If you are a pedestrian or a small step & non-automatic doors are acceptable, park on the “cinder” car park area. Enter through the double doors. TDF Reception is straight down the corridor, on the right. If you require completely level access & automatic entrance doors, proceed round the bend to the right & look for the Prosthetics Department immediately on the right. There are a number of disabled parking spaces. Enter via the automatic doors, turn left & left again into the long corridor – TDF Reception is on the right.